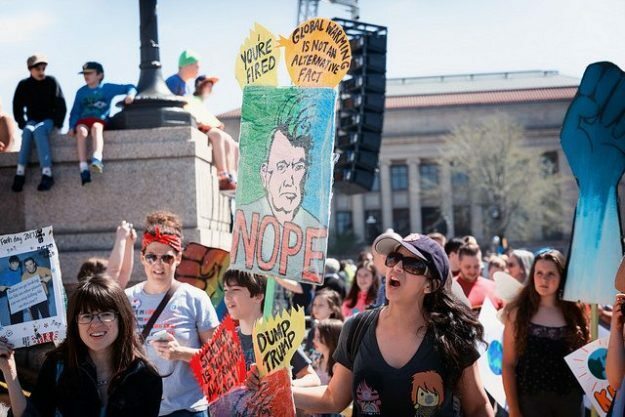 “‘Global Warming is not an Alternative Fact,’ Minnesota March for Science, St Paul.” Credit: Lorie Shaull. Many thought it couldn’t work: calling scientists out of their libraries and laboratories and into the streets to protest the potential dismantling of institutions supporting advancement of the sciences as regards critical public issues. Tens of thousands hit the streets. In Chicago, there were 40,000 participants, with more four- and five-digit totals reached in D.C., Boston, and elsewhere around the country. In fact, marches for science took place in approximately 610 locales around the globe—across Europe and Asia, and in New Zealand and Australia. Scientists and fans of science marched together, calling for the recognition of the central importance of science to society. This isn’t the first time the scientific community has gotten organized around recent policies. Readers will recall that the temporary travel ban from seven (later six) Muslim-majority countries sparked the overnight development of a network to provide housing and laboratory space to scientists whose travel to the States was banned—sometimes mid-journey. When a conference that was to have explored the public health concerns of climate change was precipitously cancelled by the CDC as Trump took office, activists from the National Park Service protested an imposed shutdown of communication by establishing an alternate twitter account to do public education on climate change. It all reflects a growing sense of activism in the scientific community. Ayana Elizabeth Johnson, a marine biologist and the march’s co-director of partnerships and a member of its diversity team, said diversity and inclusion have been core parts of the march since its beginning, but the group has had several brutally honest conversations to make sure their messaging aligned with their values. The public conversations surrounding the march, she said, are an important step toward addressing discrimination problems within science.